In case you hadn’t realized, I wrote a book and published it on May 19th! It is called Vivir el Dream and is a Latino Christian fiction book about an undocumented college student trying to make her way in the world. You can find it on Amazon for $16.99 in paperback, $3.99 in ebook. Also signed copies are available for $15 (plus $3 shipping if you’re not local). I was inspired by my friends, family, church family, and community who haven’t given up even when they’ve been through unimaginably difficult circumstances. I wanted to give a glimpse into the life of undocumented people in the U.S.: why they come here, what they have to go through to get here, and what things are like for them once they arrive. It is also rich with descriptions of authentic Mexican cuisine and culture and has elements of inspiration, light romance, and humor. You can also find out more information on my Facebook author page and on the Facebook book page. Check out my latest review! Please join me in welcoming Allison Garcia, author of Vivir el Dream and Finding Amor. N: Tell us something about yourself that most people don’t know. In college I DJ’d a radio show with my roommate…It was called The Allison and Charlene Show, and we won DJs of the Year. We were very silly and had loads of fun! N: What’s your favorite scene in “Finding Amor”, and what makes it a fave? Would you care to share an excerpt from the scene with us? Today we have a Takeover Tuesday post by Allison K. García. Read more to find out about A Merry Navidad box set collection. Love. Family. Forgiveness. Overcoming. These are the themes portrayed time and again throughout the four Latino Christian Christmas novellas in A Merry Navidad. That…and a surprising amount of tamales! The fun thing about writing a boxed set is that when each of you are working on your separate stories, you never know until the books are put together how similar they might be. In our case, each story spoke about family and love, and three out of four of us wrote very specifically about tamales! A Merry Navidad – Release Day!!! A Merry Navidad is now available for purchase on Amazon!!! I’m so excited to announce that A Merry Navidad has released today!!!! 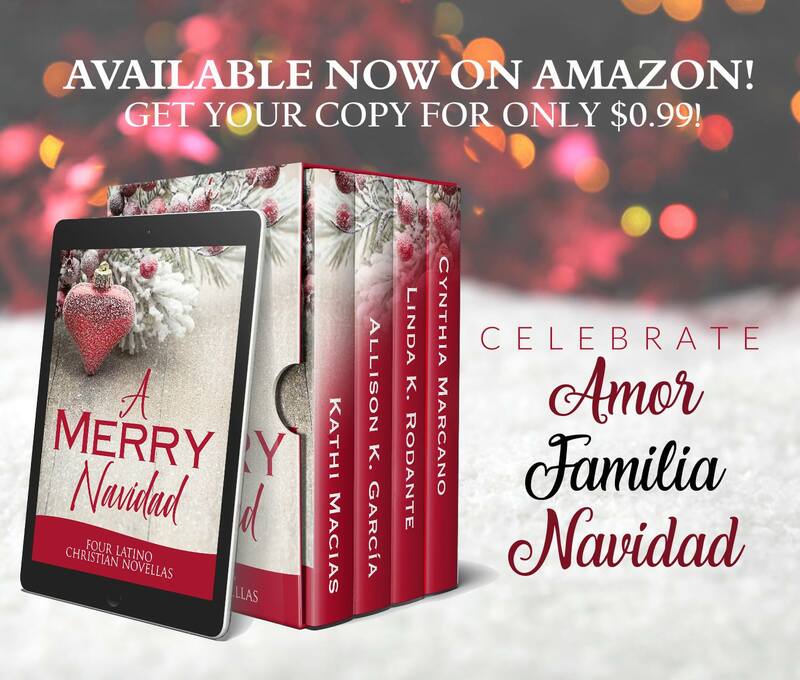 4 Latino Christian novellas celebrating a Latino Christmas – food, family, and love. There are 4 novellas, so each story is only a quarter! You can’t go wrong with that! Plus, each story comes with recipes for traditional Latino Christmas food, drinks, and desserts at the end! So, pick up your copy today on Amazon, and don’t forget to leave a review! Happy reading!!! !